Cool Tools: Primary Wall, and Wordle too! 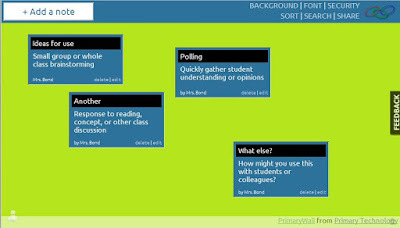 Primary Wall is a free, web based sticky note bulletin board. Click the image below to go directly to our sample Wall. Click anywhere on the screen to add ways you might use this tool to facilitate ideas or conversation with students or colleagues. In addition to a direct link, a Wall can be embedded into a website or wiki page, allowing viewers to instantly see and participate in the project or thought process. 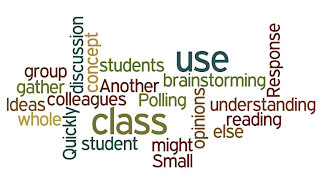 Students can post their thoughts, ideas and comments as a homework assignment, then the next morning the Wall can be displayed on the interactive board for review and discussion. Accounts are not required to set up a wall or to participate. However, a free account is required to change the background image (or color) or to set view permissions. The sample Wall is set to "Everyone," which means anyone with the url can visit and contribute. I could have also set it to be visible to "Only Me" or "Everyone with a password." If you are not familiar with Wordle, it is a free web-based tool that takes any text and creates a customizable word picture based on word frequency. Wordle can be a great tool to help students see vocabulary use in their writing, respond to reading or other class activity, reflection pieces, or a general creative display. Wordles can be viewed digitally or printed. 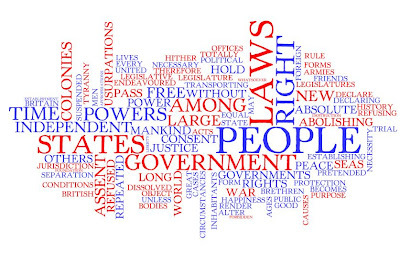 University of Oklahoma professor Laura Gibbs copied and pasted the text of the Declaration of Indpendence into Wordle. Looking at this image, what ideas do you think were important to the founding fathers? As always, for assistance in incorporating these and other tools into your classroom contact Mrs. Bond.